Lockwood buildings are constructed from plantation-grown, sustainable, solid wood, which is a natural, renewable, biodegradable product. Wood is our Earth’s most renewable raw material and using it is vital in the fight against climate change. 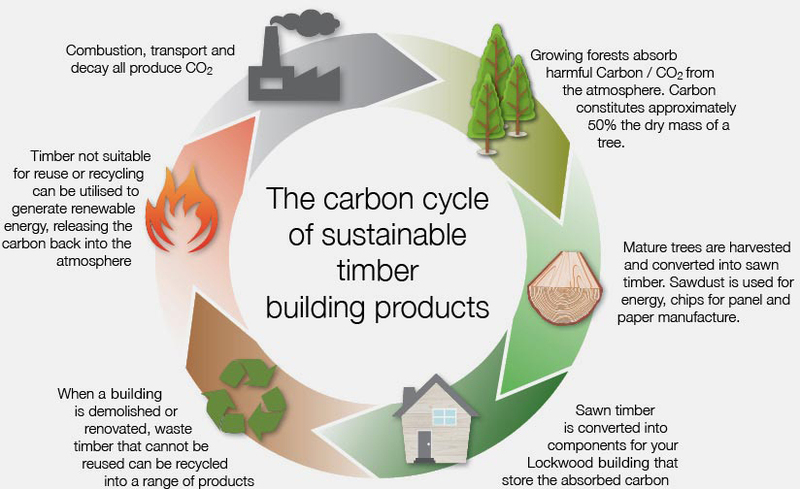 The more solid plantation wood we use, the more carbon that is stored. The more trees that are grown, the more oxygen is released into the atmosphere, and the better off our entire world will be. Solid wood requires little fossil fuel to manufacture. It has the lowest energy consumption and lowest CO2 emissions of any commonly used building material – making it kinder to our planet. Solid wood has high insulation and thermal mass, meaning less energy is needed to heat, cool and ventilate it which, for you, means lower power bills. It also acts as a passive dehumidifier at night and as a humidifier during the daytime – improving your comfort and health and actively helping to maintain your comfort. Solid wood has high insulation and thermal mass. This means less energy is needed to heat, cool and ventilate a solid wood building. The greater thermal mass of a solid wood building makes it energy efficient – making it better for the environment and lower power bills for you. Solid wood is strong yet flexible and durable. Lockwood buildings move slightly in events such as earthquakes, then return to their original position when the shaking stops. This ductility in the Lockwood Building System help keep you safe and reduce the risk of damage to your building, allowing it to weather extreme storms and ride out strong earthquakes. A standard Lockwood building, subjected to 22 simulated earthquakes up to 7.0 on the Richter scale over six weeks of laboratory testing, came through completely undamaged, with windows opening freely and all glass remaining intact. Testing also showed exterior walls can withstand more than 12 tonnes of sideways pressure from winds and earthquakes. Recent proof of this came from the Lockwood homes in Christchurch and Kaikoura, which lived up to their unshakable reputation, with almost no structural damage being reported. Lockwood buildings are strong and designed to withstand earthquakes, cyclones and powerful winds, with beams, stiffeners, posts and exterior walls laminated for structural strength, avoiding distortion or movement. Historically Lockwood buildings have proven their performance in extreme weather conditions – winds in excess of 270km per hour, blazing heat, freezing cold, torrential rain – and they have continued to be comfortable and secure throughout. This reputation for designing and constructing earthquake and cyclone-resistant buildings has helped Lockwood to develop exports in Japan, Australia, the Pacific Islands and the Middle East. For more information, watch our video on earthquake testing. A solid wood building is “alive”. Our buildings will actively help to maintain your comfort level by working with the surrounding environment to achieve a natural balance – giving you a stable, comfortable environment. Acting as a dehumidifier at night and as a humidifier during the daytime means the comfort and health of occupants is improved and makes wood the world’s No. 1 healthy building material. Forestry employs many New Zealanders. Buildings built using local materials is good for us individually, and for our economy. Solid wood is the only renewable building resource on our planet! Sleep comfortably knowing your Lockwood building works with nature, for good. Read more about New Zealand wood here.